Several weeks ago, for whatever reason (maybe I’ve lost my mind?) 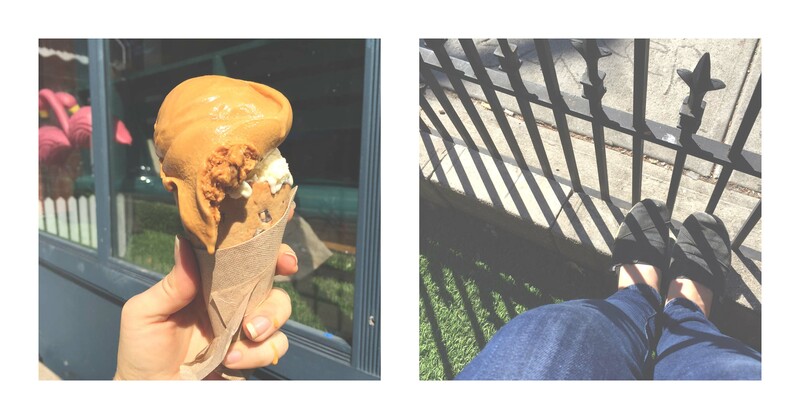 I decided I want to try out the “best of” ice cream places in the city. All at once. I eventually came to my senses and decided to adjust the list slightly and start smaller- within my own borough. And thus began the Brooklyn Ice Cream Social! Not a tour- as some of the friends who joined me – but more like a crawl. And that’s truly what it became. While we often shared ice cream within the group, we quickly became sugared out and had to search deep within ourselves to power through and persevere to visit all the places on the list. Since doing the crawl several weeks ago, I’ve kind of become obsessed with ice cream (aka, I’m totally addicted to it now). Every time I see a shop, I feel the pull- the urge to go in and check it out. Even in the grocery store, I suddenly find myself straying into forbidden territory: the frozen isle. I keep my eyes out for local, small batch ice cream companies but then have to check myself. It really has become an obsession! Hopefully though, you’ll enjoy the list and appreciate the efforts. 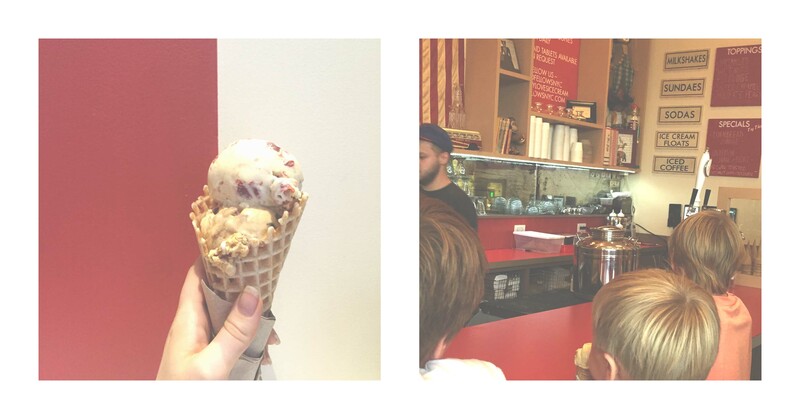 Let’s be honest- this place is my favorite ice cream shop I’ve ever been to. I’ve never been disappointed and I’ve certainly been there a lot! This shop has all your favorite classics and some really funky twists. During my most recent ice cream hunt I enjoyed their delicious Salted Crack Caramel and Ooey Gooey Ice Cream on a Chocolate Chip Cone! 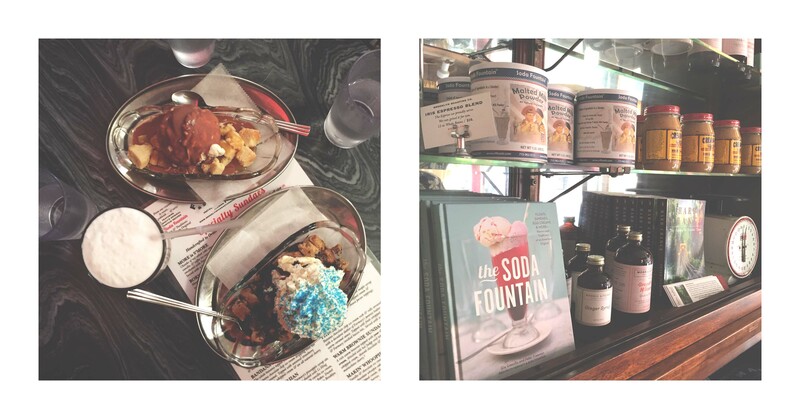 Ample Hills is family friendly but also a great date spot with seating available inside. Known for their classic-style ice cream parlor and egg creams, this place is all about the setting. 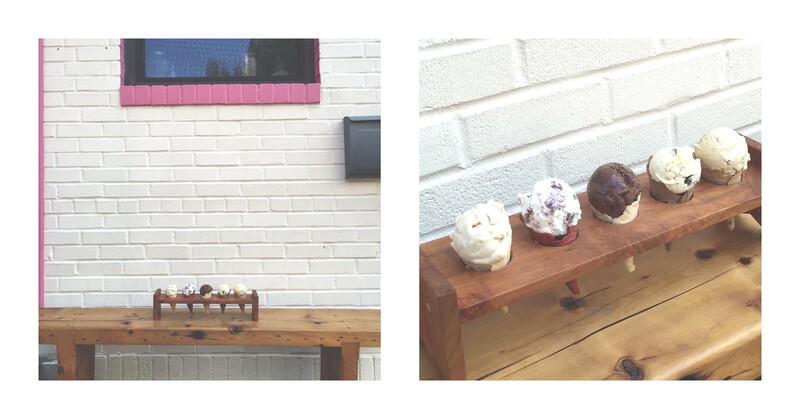 You can sit at small round tables or at the counter and enjoy their fun sundaes by yourself or to share with another. Don’t miss out on their egg cream sodas though- that’s where it’s at! This place would make for a great date spot or a fun get-together with friends. Originally an ice cream subscription company, they only recently opened a small storefront (only a block away from Brooklyn Farmacy and Soda). The ice creams available are based on their most popular flavors from previous months. Some of these included flavors like “Amagansett Salted Caramel”, “Rock Rock Rockaway Road” and “Finger Lakes PBNJ” . My personal favorite was the fact that they offer a tasting flight option! Why buy one flavor with you can get 5 mini flavors + cones?? Using only premium, certified organic dairy to make their ice cream, Blue Marble proved to be a deliciously safe bet. A particularly family friendly venue with a focus on the community, this shop also offered mini scoops making it friendly for all. You can also find their ice cream sold in various shops throughout the city! A more recent addition to Crown Heights, this unassuming shop is a pleasant surprise full of exotic flavor- each absolutely astounding. With art pieces from local artists lining the walls of the shop, Brooklyn Bell’s hits up unique flavors like “Chocolate Jamaican Curry” to “Root Beer Chip”, but also serves up the classics with delicious “Oh So Chocolate” and “French Vanilla”- this is not the a spot skip! Starting off as a food truck in 2008, Van Leeuwen eventually made Brooklyn their home base before opening other shops throughout the city and in L.A. They showcase “The Classic” scoops made from simple and traditional ingredients alongside “The Vegan” scoops which use creamy nut milks. With a relaxing coffee shop atmosphere (and yes, they serve coffee and tea) and spaced tables, they have creamy delicious regulars flavors and rotate specials weekly. The New York ice cream scene is full of funky flavors but let’s face it, when it comes to strange and bizarre combinations, OddFellows takes the cake. 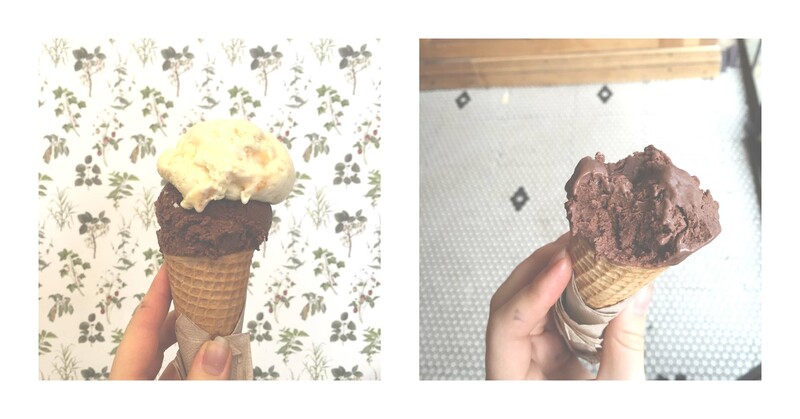 The Williamsburg-based shop is always packed and the moment you walk in, your nose is filled with the scent of cinnamon and freshly baked waffle cones-yup folks, they make ’em fresh daily! 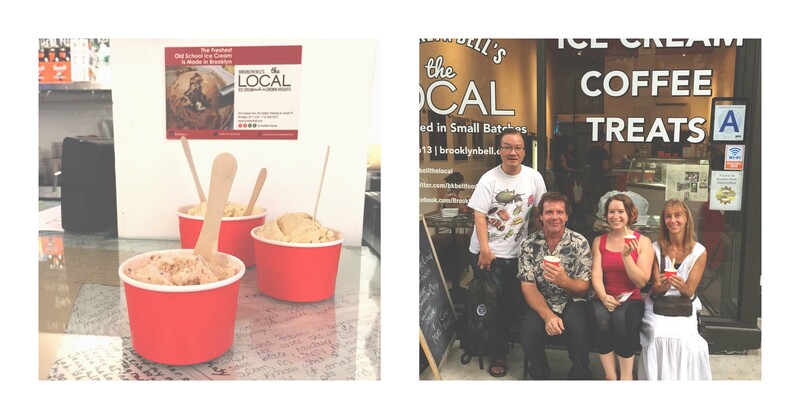 Their ice cream is made from scratch with hormone-free, additive-free dairy and they really play around with some crazy flavors like cedar vanilla, miso cherry, pink lemonade and Thai tea. 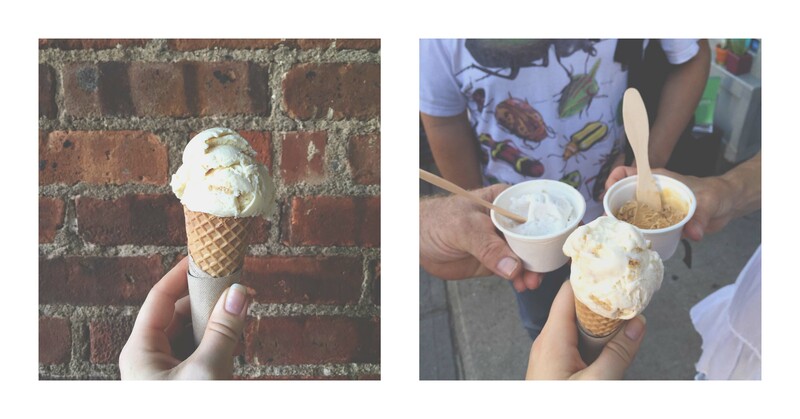 Do you have some favorite ice cream spots in NYC or around the country? Tell me about them- being a (now) recovering ice cream addict, I always want to know more!